A 17-day-long festival initiated by Dublin City Council to celebrate the upcoming Chinese New Year kicked off here on Friday night with lion dances, a reception served with dumplings and a concert presented in a combination of Chinese and Irish music. Lord Mayor of Dublin Nial Ring, Chinese Ambassador to Ireland Yue Xiaoyong, and Irish Ambassador to China Eoin O'Leary were among the 200-strong representatives from different walks of life attended the opening reception of the festival which was held at Dublin City Gallery. Addressing the event, Dublin City Mayor Nial Ring said that the festival for this year is the largest of its kind ever held by Dublin City Council since its inception in 2008. 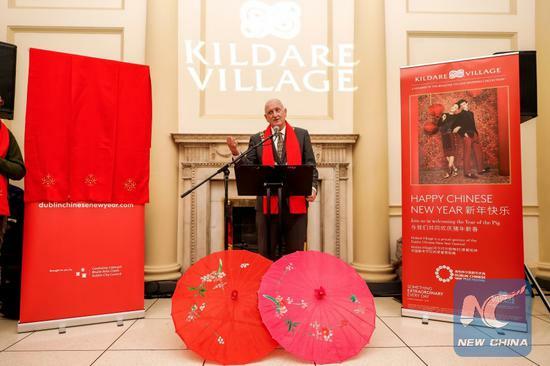 "The Chinese culture is exceptional," he said, adding that the festival will help increase the status of Dublin as a diversified and inclusive international cosmopolitan. He said this year is the Year of the Pig for the Chinese and he wished all the members of the Chinese community in Dublin as well as in Ireland a happy and prosperous new year. The mayor disclosed in his speech that he was born in the year of the pig in 1959, and he extended an invitation to all the guests at the event to participate in a birthday party he is going to host in the Mansion House, his official residence in Dublin, on May 16. Chinese Ambassador to Ireland Yue Xiaoyong and Irish Ambassador Eoin O'Leary also addressed the event, during which both of them said that 2019 marks the 40th anniversary of the establishment of the diplomatic ties between the two countries and they both wished a more fruitful new year for the China-Ireland relations. Yue and O'Leary also jointly unveiled the opening of the festival and enjoyed a concert together with local audience at the ground hall of the gallery. The performances jointly presented by a young Chinese female percussionist and a young Irish male violinist provided a unique experience for music lovers. Dublin Chinese New Year Festival has been held for 12 consecutive years, and the festival for this year is the largest of its kind, said Aimee Van Wylick, who has been a producer of the festival for the last five years. According to Wylick, over 80 programs will be staged during this year's celebrations, including concerts, acrobatic and dance performances, film, painting and calligraphy shows, various cultural workshops and lectures as well as Chinese fairs. She said that as the Chinese New Year is drawing closer, more and more exciting celebrations will be rolled out which will include a launch ceremony to light all the main landmark buildings in Dublin city on Sunday and a Chinese New Year concert to be staged by RTE National Symphony Orchestra at National Concert Hall in collaboration with Chinese musicians on Feb. 5, the first day of the Chinese New Year for this year. Prior to the opening of Dublin Chinese New Year Festival 2019, Irish President Michael D. Higgins sent a message to the organizing committee of the festival in which he said the Chinese community have played a critical role in the creation of a multicultural Ireland and he wished all members of the Chinese community in Ireland a happy and truly prosperous new year. Earlier in the day, an event entitled "Meeting China-Digital Art Exhibition" was inaugurated at the Confucius Institute of University College Dublin as part of the Happy Spring Festival activities organized by the Chinese embassy in Ireland. The three-day event, which introduces traditional Chinese culture such as shadow plays and paper cutting arts through high-tech means in an interactive way, provides a brand new and interesting experience for Chinese culture lovers. The event is expected to attract over a thousand visitors, said the organizers.